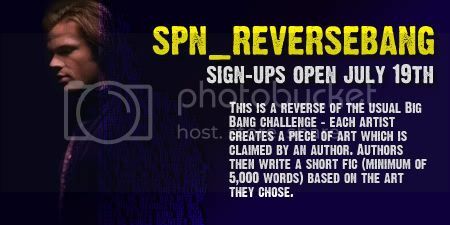 I just signed up for the Reverse Big Bang Challenge! Woooh. I think this is quite interesting – having to create a piece of art and then have an author pick it and write a story to it!! :-) It’s going to be fun and such a new and fresh idea!! :-) Loving it already. I so want to do this but I'm nervous. I would have to be a writer because my art is okay but not that skilled in photoshop and not a freehand artist at all. I want to do it though but am too scared. lol with my bigbang posting on the 16th I'm all nerve about my writing skills right now. Big Bang is a challenge where artists and writers come together and work on a common project and create something hand in hand. Whether it's a J2 story or a Supernatural story, or something else in another fandom... it's from fans for fans and the only purpose of it all is to entertain and to have fun. Sadly, I don't know about the duties of beta-ing fanart, I've never done that before. But I guess it's just giving ideas and feedback, what do do better or change or whatever. But that's just my take on it.